Uxline is a start-up company out of Vancouver Canada that originated in 2011. Uxline provides usability services to websites who want to know what every-day users experience when browsing their websites. This service provides website developers with feedback that helps them understand and modify the layout and features of their websites to make them more intuitive for their users. What do Uxline Testers do? Usability testing varies but essentially testers browse a website or test out a feature on a website while giving feedback and thoughts about the process. This has become a great way for online services to learn if their websites are user-friendly and where improvements need to be made. Testers with Uxline are contacted via email when a test is available to them. It is a good idea to move quickly as testing spots fill fast. The customer will provide a list of requirements and instructions for each test. You may be asked to find the contact information or look for a specific product. Uxline testers will complete the test through an online interface that will record your screen as your browse. Additionally, you will need to have a microphone on your computer or laptop as you will need to think out loud as you complete the tasks. By sharing your thoughts as you complete the test- clients are able to get a better sense of what it is truly like being a user of their website. How Much are Testers Paid? 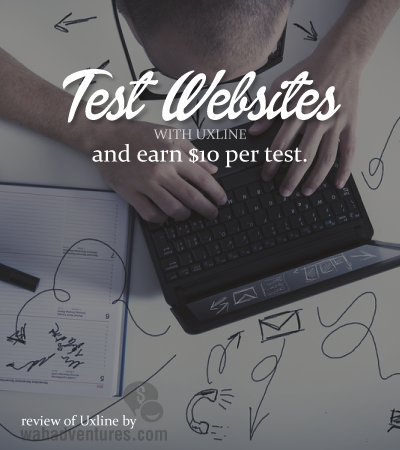 Usability testers with Uxline are paid $10 per test. This is the going rate among many other usability testing sites. Does Uxline pay with PayPal? Yes, Uxline pays with PayPal in at least 15 days of completing the website test. Being a website tester is a lot of fun. It can feel high-pressure in the moments as you are being recorded through your tests and have to speak out loud. However, many people agree that $10 testing out a site is simple work and takes less than 30 minutes. Is Usability Testing a Reliable Online Job? Unfortunately no, usability testing is not reliable. Tests are not available consistently. It is a great side job to have though! If you sign up with several usability testings sites, you can have more opportunity to qualify for tests. What is Required to be a Website Tester? This is not a work at home gig that requires you to be an expert or have previous experience. Customers of Uxline are looking for every-day users to test out their sites and give honest feedback. You simply must be 18 years or older, be able to communicate well, and good at taking instruction. Anything I Should be Cautious About? There are a couple of issues I found that cause me to pause. First, Uxline has a generous refund policy for their customers. If they are not satisfied- they are given a refund and you are not paid. Fortunately, Uxline claims this only happens about 1% of the time. Additionally, there were some spelling and grammar errors riddled throughout the Uxline website. It’s possible whoever wrote the content for the site was not completely fluent in English. Many of the Uxline related social media pages, like LinkedIn and Twitter, are written in Spanish. Currently Uxline does not have a rating with BBB.org. On the positive side, Uxline offers a variety of ways to contact them and provides their physical address as well as their telephone number. Additionally, they are listed on many sites, this shows their validity. To become a tester with Uxline you will need to go through an application process. First you will need to fill out a questionnaire. Similar to qualifying for a survey- many times the clients are looking for testers with certain demographics. The questionnaire will provide Uxline with the necessary information to match you with qualifying testing jobs. Then you must complete a pre-evaluation test. This is very common for Usability Sites. The test will check to see if you have the skills necessary to be successful as a usability tester. If you do not pass- you will be receive feedback to help you understand more of what Uxline is looking for in testers. You will be allowed to apply a total of three times. If you still have more questions and would like to know more about Uxline- visit their FAQ page for Testers. Uxline.com, is not in English. I was able to translate the site into English with chrome, however, you cannot do that within the test. So, if you are like me and only speak and read English then Uxline.com isn’t a good fit for you.